What'd you get up to this weekend? No matter what it was, it surely wasn't as absurd as a golf match between a reality TV host/leader of the free world and a country-fried rap rocker. That's right — classy celebs Kid Rock and Donald Trump joined forces for a round of golf. Rock joined Trump for a round of golf at the Trump International Golf Club at the Mar-a-Lago resort in Florida on Saturday (March 23). It's unclear who won the match, or if anyone could really be considered a winner in any capacity in this situation. 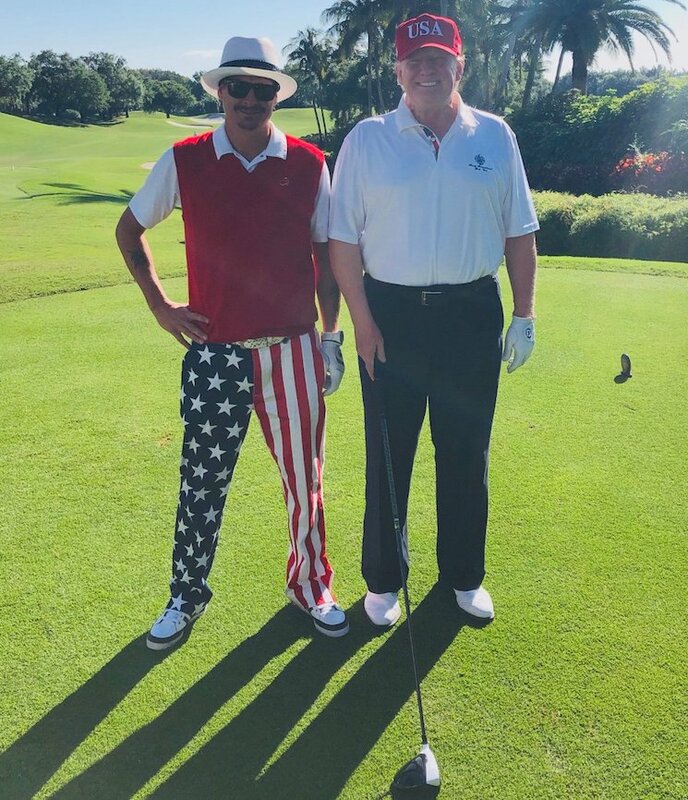 Either way, Rock posted a photo of their overtly patriotic meetup (complete with star-spangled golf pants) on Twitter, where he wrote, "Another great day on the links! Thank you to POTUS for having me and to EVERYONE at Trump International for being so wonderful. What a great man, so down to earth and so fun to be with!! KEEP AMERICA GREAT!! -Kid Rock." Who signs their tweets in 2019? Kid Rock Announces 'Sweet Southern Sugar' Album and "Greatest Show on Earth Tour"